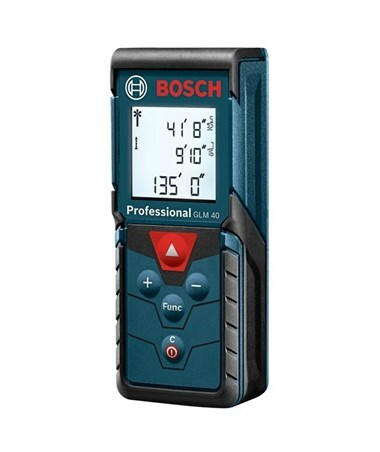 The Bosch GLM 40 135' Laser Measure 0601072912 gives you the convenience of a 10-measurement memory. No more trying to keep all the dimensions you need for your calculations in your head, or having to write them down! Now you can call them up with a few button presses. 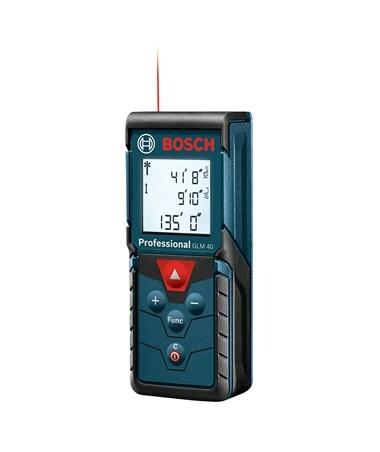 This laser meter has a number of features designed to make your life easier. You can easily switch between metric and imperial (feet and inches) measurement systems. 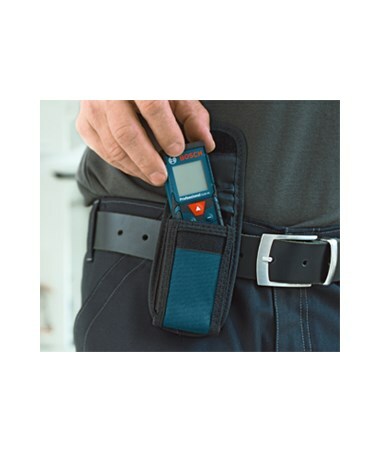 It comes with everything you need – a belt pouch, target cards, a hand strap, user manual, and 2 “AAA” batteries. This laser distance meter can measure length, surface/area, and volume. You can add and subtract measurements with ease. The GLM 40 will also do indirect height (Pythagorean) calculations for you. With the real-time measurement feature you can figure out exactly where a measurement should be by moving your laser tape measure. First, activate real-time mode. The GLM 40 will start taking measurements every 0.5 seconds. Then all you have to do is move it to the desired position and mark off your measurement. If you wish, you can also hold that measurement and re-activate real-time mode whenever you choose. 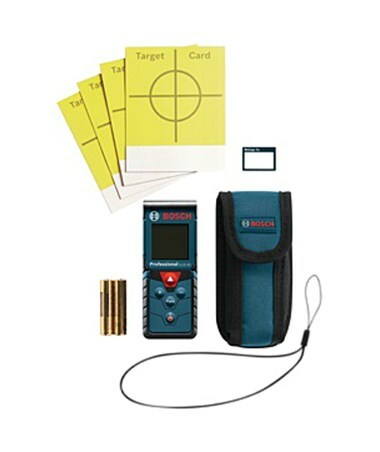 This laser measuring tool can take measurements from 6” to 135' (0.15 – 40 m) with an accuracy of ±1/16" (± 1.5 mm). It takes measurements in graduations of 1/32" (1 mm). The dimensions of this laser meter are 4.1"L x 1.6"W x 0.9"H, and it weighs 0.22 lb. The power source is 2 “AAA” batteries, which give you about 4 hours of operating time. Automatic shut-off features help save battery life. The laser will shut itself off if you don't use it for 20 seconds. The GLM 40 unit will shut off after 5 minutes of non-use. A “low battery” icon will warn you when it is time to change your batteries. 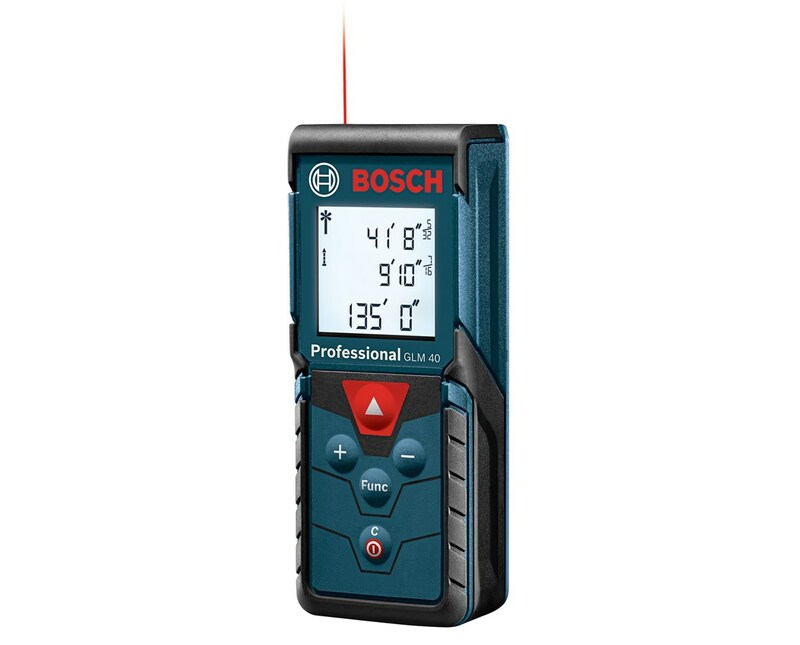 The Bosch GLM 40 135' Laser Meter comes with a 1-year limited manufacturer's warranty. If you register your unit within 8 weeks of purchase, the warranty period is extended to 2 years. Measuring Units m, ft, in.